In a large mixing bowl, whisk together all ingredients. Heat a non-stick 10”skillet over medium heat. Lightly grease the pan with cooking spray or 1/4 TB. of butter. Using a 1/4 cup measuring cup, pour the batter onto the griddle. 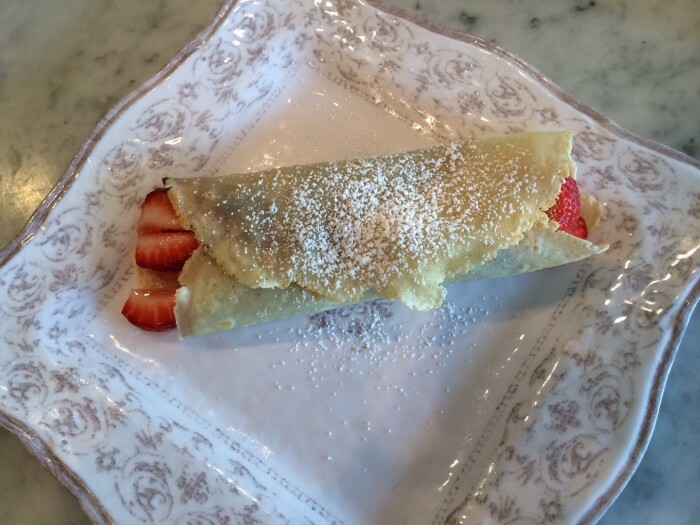 Cook the crepe for about 2 minutes, or until set and lightly brown on the bottom. Using a heat-resistant spatula, carefully loosen the sides and gently flip the crepe over. Add topping of choice: nutella, peanut butter, bananas, strawberries, chocolate chips. Fold the crepe in half and fold again. Place on plate, dust with powdered sugar, cinnamon sugar and/or whip cream.